Ireland exists in shades of green. There’s the fairway green of rolling hills, broken by huntergreen clumps of oak. The tender green of a moss-covered wall I only thought to ask about these things when I was older, but by then my grandparents were gone. As I drove through the little town of Ballyclare, where my grandmother was born, I recognized the squat brick of the town hall from a faded postcard she had saved. In the nearby hamlet of Glenwherry I found the church where she married my grandfather before they boarded a ship to a new life in Canada. But no one was around and I couldn’t get in. I don’t know what I was hoping to find in those places. In truth, they raised more questions than answers. Who am I? Where did I come from? How much of my nature could be traced to this strange island? And it is a strange place—a place where everyone is a poet, gifted with a silver tongue, and where every hill is rooted in pre-Christian myth. What aspects of that place shaped my life, an ocean away? When my job as a travel writer finally presented me with an opportunity to visit, I decided to find out for myself. I met up with photographer Colin O’Connor in Belfast to take a road trip of the geographic north of the island. I was searching for some connection to the spirit of place—a sense of my own cultural DNA—and we both hoped to indulge in our shared passion for hiking. Ireland would have something to offer us both. My fellow passengers paused in shock, and then burst into laughter. Colin and I were sitting on the top deck of a city tour bus, using this quick survey of the city centre to orient ourselves. It was far more informative than I’d ever expected, and the guide provided us with an introduction to Irish character. We wound through lanes of red brick row houses tarnished by black streaks of soot—the dwellings of the workers who had turned Belfast into one of the richest cities in Europe. When the world cotton supply dried up during the American Civil War, linen was the next available fabric, and Belfast was ready to cash in. Millionaires sprouted up overnight, but it wasn’t to last. Religious strife between Catholics and Protestants plunged Northern Ireland into decades of violence. Our thoughts were drawn back to those times as the tour came to a close. Despite the misery he himself had lived through, the guide’s Irish penchant for deadpan wit shone through with a twinkle and a barely suppressed grin. I sensed it was a necessary coping mechanism in a country that had lived through centuries of poverty and violence. Belfast is a highly walkable city. As I strolled I saw the same people over and over. Its nighttime streets were quiet, but one had only to open the door of a random pub to find it packed to the rafters with welcome and good cheer. In Ireland, the pub is your living room away from home. It’s where you go for quiet conversation with friends—friends who probably know your entire family. It’s where you find home-cooked food like lamb shank and champ (mashed potatoes with green onions chopped in), for a reasonable price. And it’s where I went to sit in a warm corner to write. Such places inspired me because I could listen to the language of the Irish, whose everyday speech is moulded by Gaelic rhythms. That poetry provided a cadence to my prose: Articles by Guinness. I sipped my first pint at a back-alley pub called Kelly’s Cellars. While no one knows its exact age, Kelly’s is acknowledged to be the oldest surviving, continually run pub in Belfast. Popular with writers, actors and political types, its thick stone walls are whitewashed like a crofter’s cottage or an ancient fortification, and the resulting atmosphere was intimate. It reassured me that the majority of patrons preferred the traditional Irish stout to lighter ales or imported lagers. The profound blackness of Guinness, with its creamy white head, is the perfect blend of light and dark. With an overabundance of pints under your belt, you could begin to enact the natures of each. Struck by the wisdom of such an approach, I made a discreet entry in my notebook to secure a prescription for the liquor store upon my return home. The next morning Colin and I fired up our rental car and headed north. We escaped the city traffic and were hurtling down country lanes bordered by stone walls. Hills rolled to the horizon, where wandering walls divided them into patchwork, dotted with puffs of sheep. We had an appointment at the Old Bushmills Distillery, the oldest licensed whiskey distillery in the world (established in 1608). That noble spirit is an Irish icon and Bushmills is the flagship of the North. The distillery was also a waypoint from the murky recesses of my past. I’ve never forgotten the photos that fell out of one of my grandmother’s old letters: a group of elderly Irishmen and women, beet red in the face from an excess of good cheer, posed arm in arm in front of a copper still embossed with the Bushmills logo. The whiskey’s scent was rich and fruity. It floated across my palate like a silky caress, but there was nothing feminine about it. This was full and brooding, contemplative, with a dry cereal finish: a whiskey to accompany deep leather armchairs, philosophy, and the acrid scent of a peat fire. He said it with a smile, but I sensed he believed it. In a country where every rock and tree could be inhabited by a spirit, why should distilling be any different? From Bushmills, it was 10 minutes to the north coast and the Giant’s Causeway. It was on our way, and my grandmother mentioned having visited it as a child. I wanted to see it for myself. Blue-black clouds hung low over deepgreen fields, where a single shaft of light spotlit a whitewashed cottage in the distance. As we walked down to the sea, a cold drizzle began to fall, whipped horizontally by a biting wind. The Causeway is Northern Ireland’s premier tourist site: a bizarre geological formation of black basalt columns, the result of a subterranean eruption some 60 million years ago. As the molten basalt hardened it formed into polygonal “crystals” stretching from Northern Ireland to distant Scotland. Thanks to its seemingly planned regularity, it really does look like the giant Finn MacCool’s road. Colin was mesmerized by the steady geometry of the rocks backed by grassy coastal cliffs, which looked as though the land had been bitten off and then softly eroded. But for me the Causeway was just a strange pile of stones on an inhospitable day. I couldn’t buy into the myth about the giant, Finn, building it. I only sensed its mystery when I picked my way out to where the slippery stones were surrounded on three sides by the sea. Unfeeling blackness hinted at depth and great cold as the waters rose and fell in strange asymmetrical patterns. My gaze softened and I was drawn into its rhythm, slipping gradually into a disembodied state. It felt as though the entire world was inhaling and exhaling, and I could have sat there for hours just watching it. As night fell, I walked along the cove of a nearby village. The lights of the harbour were mirrored in the ebbing and swelling sea and the diffused radiance of low clouds shimmered long silver pathways into the distance. Like Jacob’s ladder, these pathways could only be seen from a particular angle, or perhaps a particular mindset. They vanished with the slightest shift. I stood there entranced as Colin walked on. 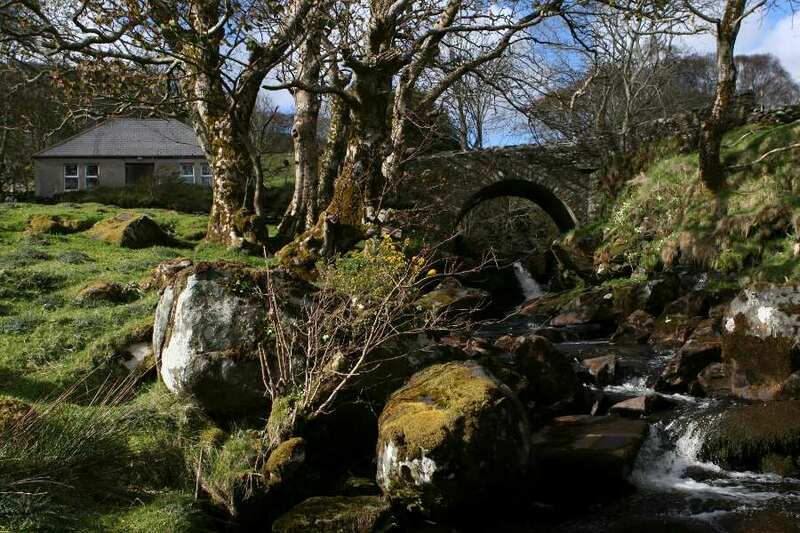 As much as Ireland is defined in shades of green, it is also defined by its light. It’s a gently glowing light filtered through the essence of emeralds and softened by moisture. At times it’s almost mystical—where it slants down between the trees, or when it blesses the white of a cottage wall. People confronted daily by such light can be forgiven for believing in fairies. In such places, one can’t help feeling that the mirror of reality is soft, and that it would be easy to fall right through. At breakfast, I loaded up on all those Irish foods I’d come to love as a child. Scones and fadge (a flat potato bread typically fried in bacon grease), back bacon, thick links of sausage and scrambled eggs. Fadge and scones corrupted my family. Cousin stole from cousin, father from son, and when my grandmother cooked up a yearly Christmas batch, my dad and I collaborated on elaborate ruses to score ourselves a few extra packages. But it was always an uneasy truce. You can imagine the glee with which I filled up on these foods each morning before we set out. Conscious of the need to push all that cholesterol through my innards, I stepped over to the porridge table for a bowl of Irish health food. The polished wood was set with a pot of golden heather honey and a jar of fresh cream, the bountiful fruits of the land we were travelling. It was also set with a bottle next to a small sign: “Why not try a little Irish whiskey on your porridge?” I nearly laughed aloud, until I realized they were serious. That morning we crossed the border into County Donegal and entered the Republic of Ireland. Colin assured me that Donegal was prime hiking territory. It had no direct connection to my family history, but by then I knew it was a sense of the land I was after, and how that landscape shaped the character of its people. Exploring on foot was essential to my understanding. It felt like we’d driven to the ends of the Earth. The green mountains of Derry were abruptly transformed into a barren, wind burnt landscape of wild hills and scraped out hollows. Coarse brown brush, tough and stemmy, was interspersed with blanket bogs and thick growths of tangled green that clogged the hollows. Stones stuck up everywhere. The roads were paved, but barely wider than a single lane. The macadam was frost heaved, rutted from having been built on squelchy ground. Ireland is an agricultural topography interrupted by wild places still unscarred by human activity. 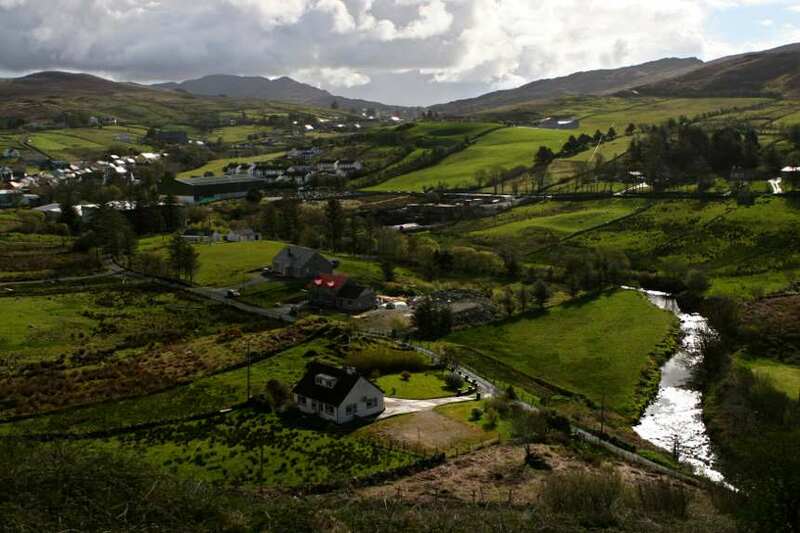 Villages are widely separated in northern Donegal, with only a few houses at best. One tiny village of perhaps 60 souls perched on a hill has six pubs and an off-licence, but nothing else. The road signs were bilingual English and Irish, and then only Irish. After poking around the countryside for strange bits of local lore—places like the Rock of Doon, a little bushy outcrop that was once the ceremonial crowning site of the O’Donnell chieftans—we decided to summit Mount Errigal, the highest peak in Donegal. Because Ireland is geographically small, we were able to drive there in an hour. We pulled the car to the roadside beneath what looked like a towering cinder cone of grey streaked in red. The top half of the peak was barren of plant life, promising a commanding view. I put a bottle of water and a snack in my day pack and set out. The route was a boggy slog through hummocky grass and spongy vegetation. We charted a zigzag course, hopping between patches of firm ground. I tried not to stand in one place for too long because each time I did, water seeped up around my boots and I was overtaken by a slightly sinking feeling. The pace picked up, and so did the incline, when we continued climbing past the vegetation line. The mountain is an abrupt shaft of stony quartz, which makes for firm hiking but also means negotiating slopes of loose rock. It’s a thigh-burning, lung-bursting push with no respite from the constant elevation. Errigal is a double-peaked mountain, and the final push involved walking a narrow ridge line between the shorter and higher peaks. Wind ripped at my jacket and pants as I fought for balance against the irregular gusts. I couldn’t see the eastern face, but I knew it was an awfully long way down. It was everything I could ask for in a hike. We made the summit in a brisk hour and a half. Down by the road, it was warm in jeans and a T-shirt, but near the top I needed a toque and gloves. Sitting on the lee side of the peak, we had incredible views over Donegal, the sea and the sharp indent of the Poisoned Glen—where the mythical cyclops Balor of the Evil Eye was felled. Every visible landscape feature was linked to a legend, because the Irish are a nation of storytellers. As I consulted a book to match each element to its tale, I realized this was the insight I’d come to Ireland to find. I never had a national mythology to connect to, because I didn’t identify myself with Canadian values. I had always created my own personal corpus of myth. But true to my Irish ancestors, each story in my life was firmly rooted to a place or a landscape. It didn’t seem to matter how far that was transplanted. The “spirit of place” would always find an outlet. To the east, black clouds slid in from the deep green cliffs of the Northern Ireland we’d left behind. And down by the road, a narrow ribbon in all that barrenness, I spotted the white walls of a pub tucked up against a lake. 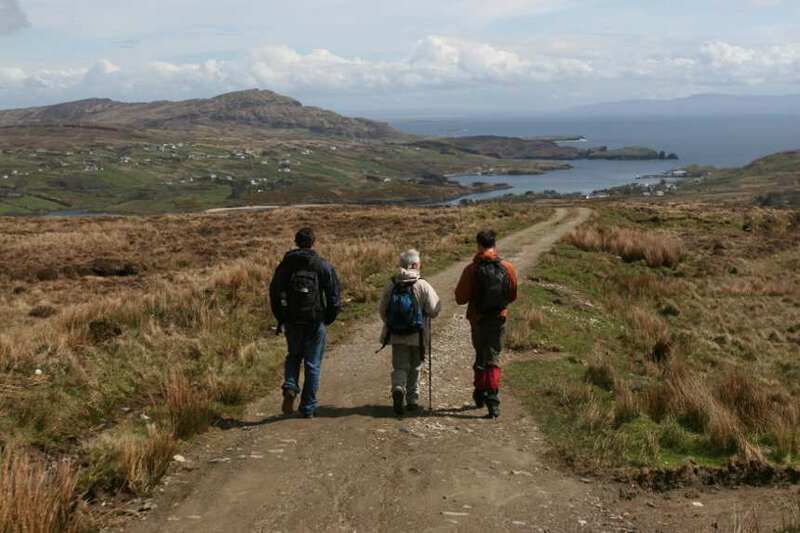 Only in pint-sized Ireland can you scale a lofty peak in the morning and be back in time for lunch. Constant movement was wearing us out. We needed a place to sink into for a few days, a room to call home and a neighbourhood to loaf about in. And so our Donegal base became the lovely town of Ardara, population 578, whose narrow main street ran down a hill clustered with yellow and blue pastel-coloured shops. On our first evening in town we stepped into a pub called Nancy’s for dinner, which proved to be one of those fortuitous coincidences that shape a trip. I sat at a rough-hewn table beside the peat fire, writing my notes until a carefully poured pint of Guinness finally arrived, accompanied by a plate of raw oysters on the half shell. The oysters tasted like a kiss on the lips by the sea. I followed them with a ploughman’s lunch—sharp chunks of local cheese that almost stung my mouth, moderated by coarse bread and crisp vegetable sticks. Such food was honest and earthy, and it tasted of the land; the perfect complement to our surroundings. Nancy’s was the sort of place where regulars will leave you alone to mull over your drink, but they’re just as ready to be your friend if you only make the effort to talk to someone. We ended up in a small side room with Charlie, the owner, huddled around an old floor-model TV, where he patiently explained the intricacies of football to a pair of foreigners from a country that knows nothing but hockey. “How long have you owned this pub, Charlie?” Colin asked, snapping a photo of his white-bearded face. I found that continuity difficult to imagine. My family had only been in Canada for two generations. Traditional music thrives in Ireland, even among the young, and people still bring their instruments to the pub. Its rhythms are filled with rousing reels that can inject a jig into even the most inept of legs. But Irish songs are also rich in melancholy: the laments of a people who were for so long doomed to go away. By 10 p.m., Nancy’s was packed. We found ourselves dragged into a pub quiz where, apart from the geography questions, we were thoroughly tarred. We did manage to save our national pride by coming in second-last, beating a Welsh couple who were even more out of touch with local soccer and television than we were. We finally tore ourselves away at 1 a.m. Charlie pulled us aside as we were about to leave. Early closing hours are mandated by law, but in Ireland hospitality comes first. Blackout curtains had already been drawn over the windows. Charlie walked us to a side door, opened it carefully, and poked out his head to scan the street. Satisfied that all was well, he ushered us through with a whispered “Good night, lads.” From the street you’d never imagine the pub was still full. Our last day in Donegal dawned overcast and grey, and with a bit of a thick head. Neither of us enjoyed the fast winding drive south to Teelin on the coast. 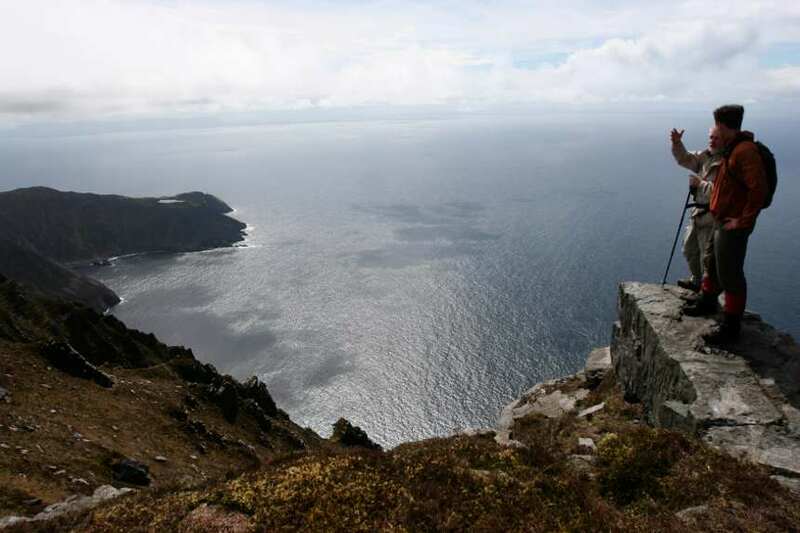 We decided to end our journey by hiking Slieve League with Paddy Clarke. Too much easy living over the past few days had left us sluggish. Clinging precariously to the highest sea cliffs in Europe seemed like the perfect antidote. A short, white-haired man with a hiker’s build and a close-cropped white beard, Paddy is a repository of arcane knowledge about the surrounding hills. He squinted us over as we stepped through his door. Set to rights by a jagged shot of caffeine, we drove up the winding road to the last parking lot before the cliffs. At the visitor’s overlook, we paused to stare full in the face of the Amharc Mor, a sheer rock wall that drops nearly 600 staggering metres from sky to sea, slate grey patched by the white, red and amber of glittering mineral deposits. “Where will we hike?” I asked, turning to Paddy. He scanned the cliff face before pointing to the highest rocky ridge. “The wind doesn’t seem too bad today, so we should be able to get right up there. We’ll decide when we’re closer. It can change in a moment, and your chances along with it.” he told us. With that, we started up a hillside path of mud and boggy turf, picking our way carefully up the backside of the mountain. As we stepped from dry clump to dry clump, Paddy spun out a running tale of the hills around us, of the stone cells of religious ascetics, of vanished monasteries, and the scars of peat extraction on distant slopes. We did our best to keep up. When we finally crested the ridge, the parking area was a flat smudge of darkness to our lower left, and the entire coast of green-eyed Sligo lay spread out before us. White sea foam beat the base of the cliffs and breakers heaved in the middle distance, but the enormity of empty distance robbed them of sound. “Has anyone ever gone over the side?” Colin asked, stepping back to change his camera lense. On that cautionary note, we made our final push to the summit. We’d heard so much about One Man’s Path, a narrow ridgeline traverse, but it turned out to be a pleasant stroll next to the lesser-known route Paddy chose for us. The knife edge was exactly that: a threefoot-wide spine of rock that climbs at 45 degrees to connect two peaks. To our left, Slieve League plunged 600 metres to the endless sea. To our right, a steep slope of heather and rocks dropped at least 300 metres to a small round lake. We inched along in a half-crouch, hands groping the rock and stomachs firmly knotted. Only when we were halfway up did Paddy mention he was afraid of heights. Back in Ardara, we stopped at the Corner House bar to slake our post-hike thirst. It reminded me of the type of vanishing small town hotel I might find near my hometown in Southern Ontario. Once inside, we could just as easily be in Jasper, or Spencerville, or even in Oompah. It also held the same sort of characters. We struck up a conversation with a group of old men at a corner table, four local cronies on the waning end of a countryside tour. They reminded me of my father. He had a nose for finding such places, and a palette of storied acquaintances just like these. Though my dad had never been to Ireland, he had in a sense fallen into these same Irish patterns, exported to Canada through generations of immigrants. It was firmly embossed upon his DNA. When the old men finally staggered home for dinner, Colin and I walked up the street to Nancy’s. Charlie was behind the bar. He looked up as we opened the door. I couldn’t help smiling at the unexpected warmth of his welcome. When we stepped up to the rail, two pints of Guinness had already been poured for us. That’s when I finally realized Ireland had never felt like a foreign country on the western fringes of Europe, because throughout our journey we had never once been treated like strangers. It felt like going home.